Snow will be coming any day now, there's been plenty of frost, and it's wicked cold when I leave work each night, so that means it's time to start soup making again. It seems like in the summer, I eat a lot of salads and not much soup and then in the fall and winter it's the opposite- all sorts of yummy soups and not much salad. I suppose it makes sense because when it's 90 degrees out, who wants to eat anything hot. But, when it's below zero and the wind is howling, soup is delicious. Anyhow, so I have my go to cream of brocolli soup recipe thanks to an old post from The Little Girl's Guide to Sugar and Spice but I have never really found a cream of cauliflower soup recipe that I love. 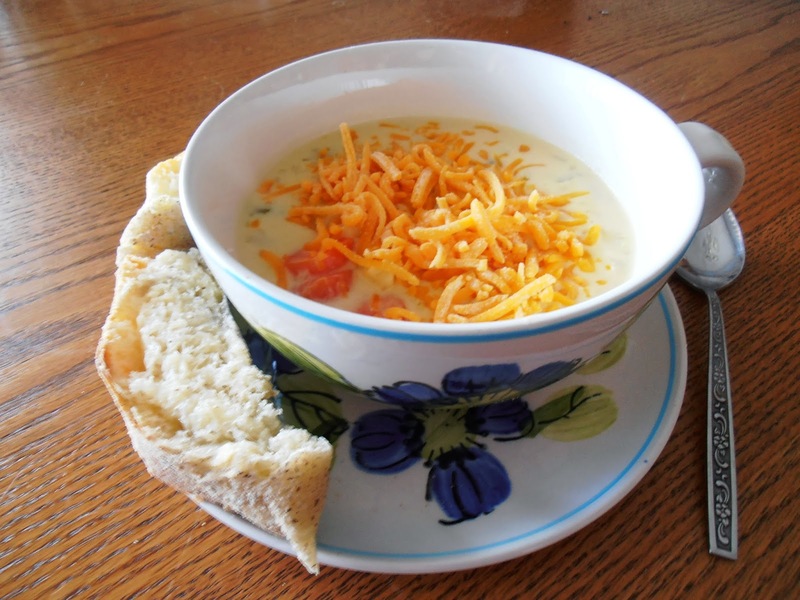 So, I thought about what kinds of things I love in soup, and just gave it a whirl. This is what I learned. 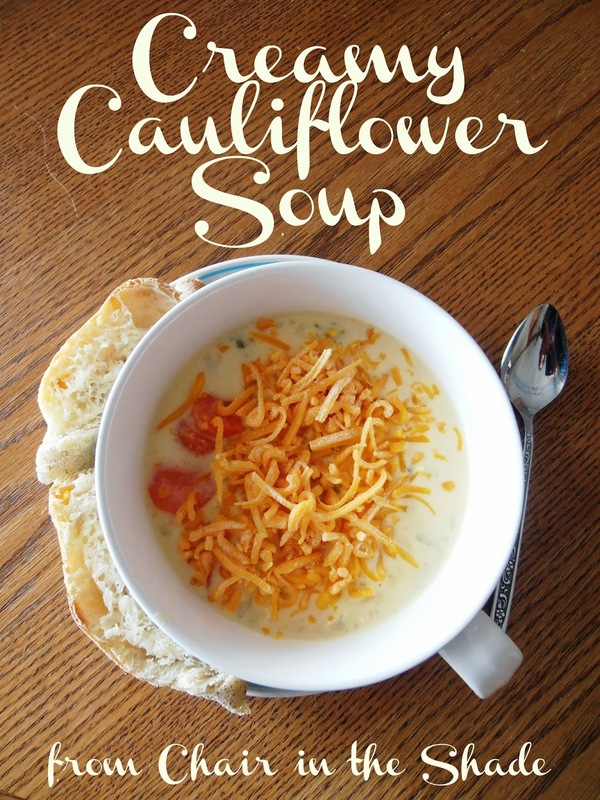 You don't have to precook your cauliflower, or roast it in the oven to make good soup. Evaporated milk makes your soup super rich and creamy. Skipping the emulsion blender gives you nice chunks of carrots and cauliflower in your final product, which I like. Making my own recipe up isn't nearly as scarey as I thought it'd be. Set a large kettle on your stove and melt butter over low heat. While the butter is melting, finely chop your celery and garlic. Add to butter, and saute until celery and garlic are tender, add chopped carrots and flour. Stir until all are evenly coated. Add 2 cups chicken broth, and 1 cup of water. Stir in finely chopped cauliflower. Put lid on kettle and cook over medium heat until cauliflower is cooked. About 15 minutes. Add can of evaporated milk and cook until starts to bubble. Salt and pepper to taste. May sprinkle with cheddar cheese if desired. Being from Wisconsin, I of course add cheddar cheese and lots of it! It's also great with homemade bread to dip in it. (Toast or English muffins work in a pinch.) I used ciabatta I learned to make while taking Craftsy's Artisan Bread Making class. They're even offering 25% off all their food classes in November. And if funds are a little tight or you're not sure you'll like Craftsy (which I'm sure you will, but whatever) you can take the Perfect Pizza at Home class for FREE, which is taught by Peter Reinhart, who also teaches the bread class. Just go sign up. No credit card info needed, no commitment, no pressure. Finally, Craftsy is hosting a recipe contest. I'm entering my creamy cauliflower soup. If you want to enter, go to the recipe submission page and submit yours. The winners will receive a free Craftsy food class and have their recipe featured on Craftsy. So there you have it. Make good food and win a prize! What recipe would you share?